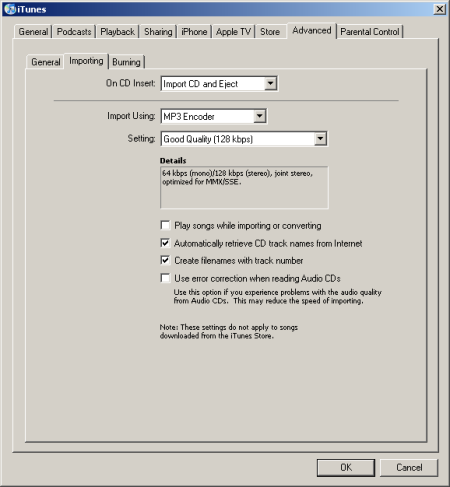 On this page you’ll find information about importing a CD, ripping with iTunes 7. This information can be seen as part of the process of converting WAV to MP3. At which the WAV files of your recording of a vinyl record, first will be copied to an audio CD and next, by means of importing/ripping the CD, converted to MP3. This seems a time-consuming process, but since this site is about converting vinyl records to CD, this is the most obvious way. The information on this page concerns self burned audio CD’s as well as CD’s from the music shop. Start iTunes and place a music CD or your own burned audio CD into the CD/DVD player of the computer. Before you start ripping with iTunes 7, it is wise to look at the preferences first. For the settings of importing/ripping go to the menu Edit, Preferences…, select the ‘Advanced’ tab and then ‘Importing’. See picture below. Setting: ‘Good Quality (128 kbps)’ This is sufficient for most MP3 players, if you want higher quality just select it. The higher the quality the larger the MP3 files. 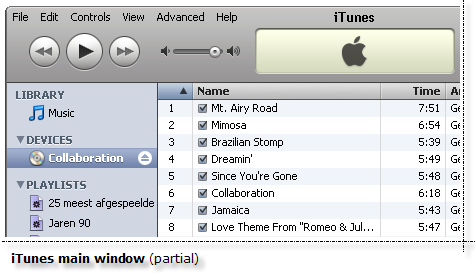 Remove the check at ‘Play songs while importing or converting’ if you only want to import songs. Change the settings corresponding the picture above, or to your likings and click OK.
Now you’re prepared to import a CD with iTunes 7. 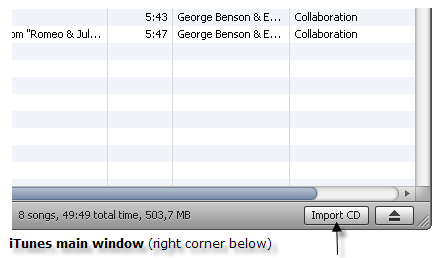 Click on the ‘Import CD’ button, in the right corner below in the main window… After about 5 minutes the CD has been converted into MP3. Now you can copy your MP3 files to your MP3 player and listen to your favourite vinyl album everywhere. Back to top of ‘Ripping with iTunes 7’ page.